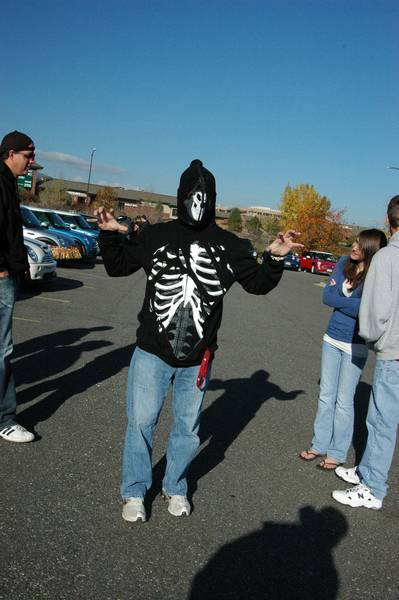 In the fall of each year the MINI5280 club located in the Denver area holds an event called Yalla Yalla. This event is meant to celebrate the founding of the club back in 2002 as well as the release by BMW of the new MINI. 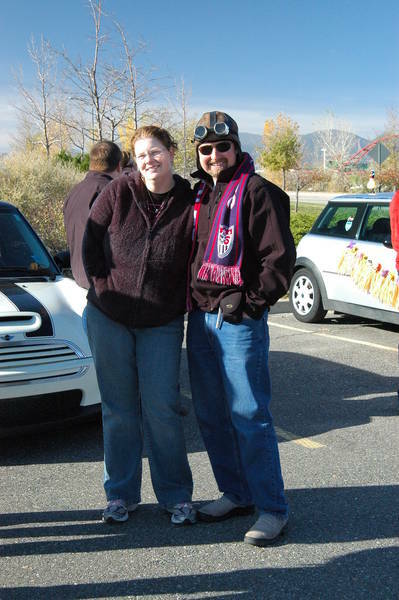 The MINI5280 club was started as a way for fellow MINI motoring enthusiasts to socialize and share in a common passion of all things MINI. 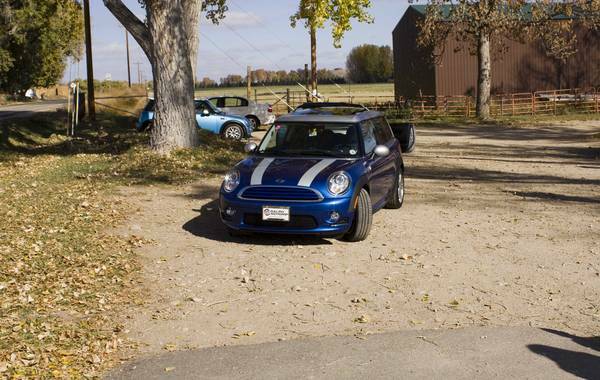 Now, six years hence, the club boasts over 200 members within the Rocky Mountain region and annually hosts the nationally recognized MINIs in the Mountains each August. Club events include monthly informal drives, poker runs, scavenger hunts and track days. The club holds monthly meetings and publishes a monthly newsletter to keep all members informed about MINI happenings both locally and nationally. 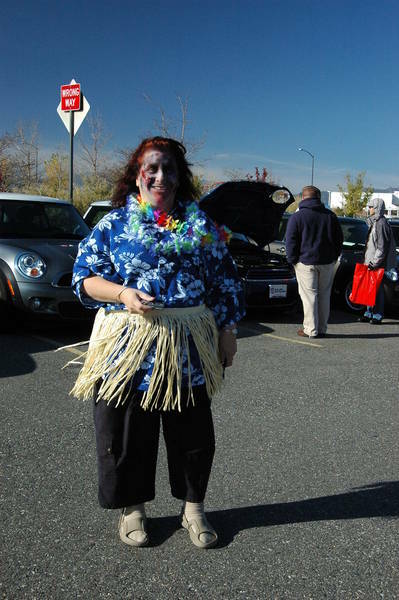 This year’s Yalla Yalla was held on October 26th and was strategically planned to occur on a Denver Broncos off weekend to increase attendance. Yalla Yalla is a ride, a quiz, a scavenger hunt and a musical discovery. It is a mysterious journey to an unknown destination and getting there is most of the fun. 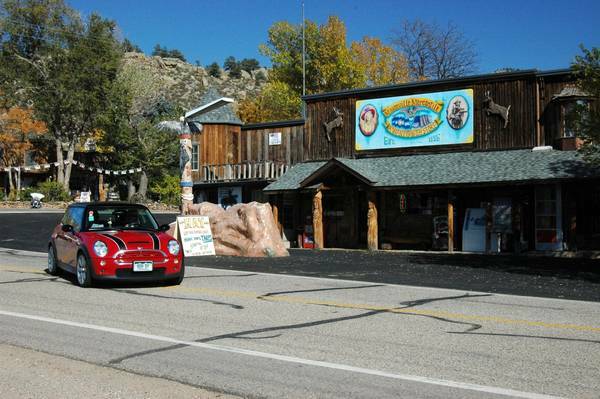 Our journey this year began in Louisville, CO which lies northwest of Denver, at the Old Santa Fe restaurant. The drivers were given bags containing gifts from Detailers Paradise, Ralph Schomp MINI and MINI Motoring Graphics as well as the Adventure Guide, Yalla Yalla music CD and route sheets. More importantly from a scoring standpoint, the bags contained the music quiz, route quiz and an Emergency Lostitude envelope (in case they just couldn’t find their way home). It was easy to tell those drivers who read the instructions from those who didn’t as the first route quiz question was found above the restaurant’s door. 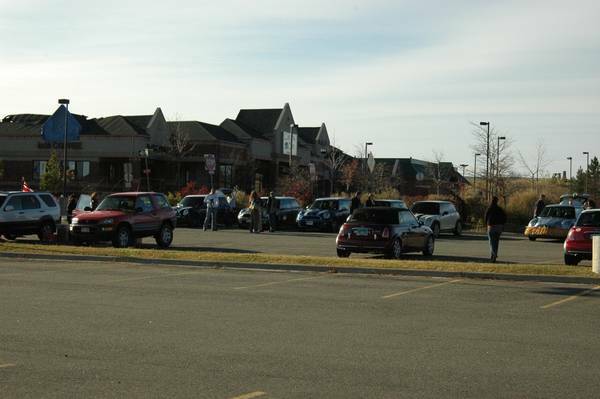 Many a MINI was seen departing the parking lot only to have to return to find the first answer. A total of 36 Yalla Yalla drivers began the course which took them through Boulder, Hygiene, Masonville, Loveland and Longmont Colorado. The organizers of the event purposely forgot to mention at the start that there were two different routes, so just north of Boulder half the drivers turned one way while the other half turned the other. Confusion was rampant and true Yalla Yalla was obtained. As suggested, most drivers had a designated navigator and the few that didn’t soon wished they had. Yalla Yalla reportedly is derived from a word used on the island of Bali which loosely translated means to wander about. Rest assured that in true MINI5280 spirit there was much Yalla Yalla on this particular Sunday. 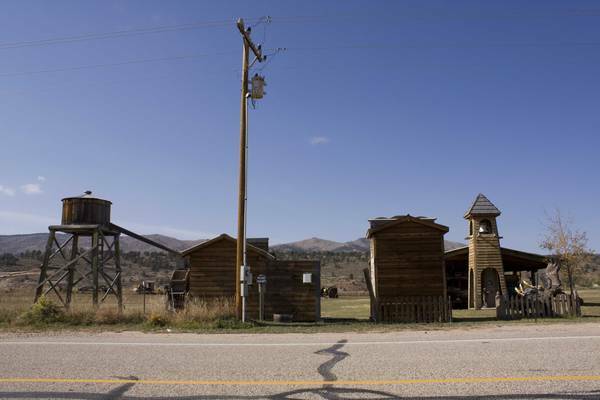 Participants were given vague word clues for route turns and destinations and the two routes crossed in the scenic lands west of Longmont. 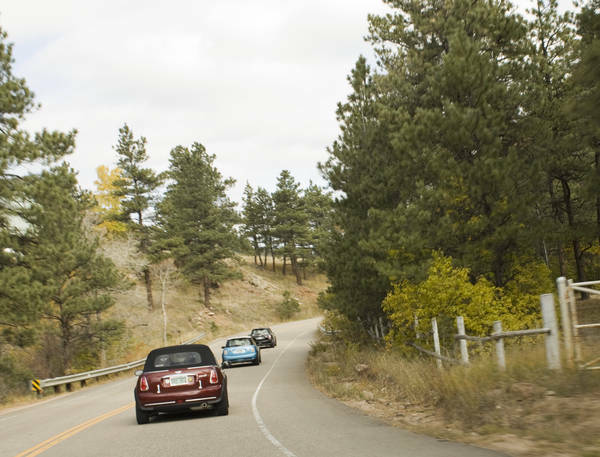 Through Carter Lake, Left-hand Canyon and the back roads of our colorful State, MINIs traveled and wandered, passing others coming from where they were going and having just come from where the passers-by were heading. Three check-points were provided to ensure drivers could get back on track and to keep track of drivers. Mid-point was in Masonville at the Masonville Mercantile, which actually held several answers to the route quiz as well as the one scavenger hunt item. Our aptly chosen theme this year, being so close to Halloween, was Lost Souls and the music CD enhanced the Halloween season as well as the Lost Souls theme. A total of 18 points could be had if all music quiz questions were answered correctly. Two bonus points were added if a link could be found between Alfred Hitchcock and the new MINI in six connections or less. The route quiz contained another 18 possible points regardless of the route assigned. Again, two extra points were awarded if the riders could correctly answer a route bonus question and if they brought to the finish a fortune ticket purchased from the Mercantile. In the end, all participants finished (or were at least accounted for) at the Louisville Recreation Center. Prizes from Detailers Paradise were awarded for high scores on the music and route quizzes, overall points, first and last to finish, driver to finish closest to average and best dressed MINI. A drawing was then held using raffle tickets handed out in Masonville and each participant walked away from Yalla Yalla with a nice prize for their effort. MINI5280 wishes to thank this year’s Yalla Yalla sponsors; Detailers Paradise, Ralph Schomp MINI, MINI Motoring Graphics and Checker Auto for their generous contributions of prizes for the participants. We also wish to thank the event organizers; Ms. Teena Craighill, Ms. Kim Stone, Mr. David Bierbaumer and Mr. Don Suiter. We also need to thank the owners of Old Santa Fe restaurant for allowing us to use their parking lot as a starting spot and the owners of the Masonville Mercantile for opening early and allowing us to overwhelm them. Finally we wish to apologize to the woman who was obviously perturbed that this year’s Yalla Yalla selected her neighborhood as part of the route and the woman at the Carter Lake Marina Store who patiently answered the same route question from 36 lost MINIs. MINI5280 is a non-profit collection of motoring enthusiasts and is open to the general public interested in membership. Our website can be found at: www.MINI5280.org. Membership information can be found on the site as can event photos, a club calendar and past newsletters.